If you have two different versions of a scene that need to be brought together, you can merge them. From the top menu, select Edit > Open Merge Editor. The Choose Scene Versions for Merge window opens. 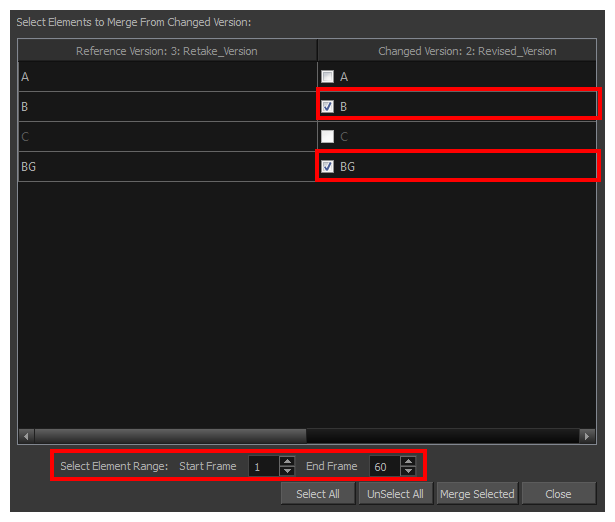 In the Select Version to Merge Changes From list, select the scene version from which you want to merge the changes from in your current open version. 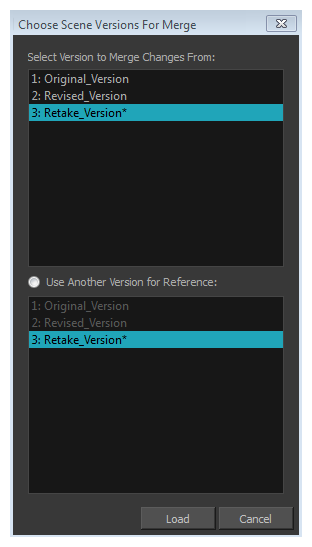 In the Use Another Version for Reference section, you can select a different scene version to merge the changes into, rather than your current version. From the right column, select the layers you want to merge the changes from into the reference version. In the Select Element Range section, set the Start Frame and End Frame fields to indicate from what frame to what frame you want to take the changes from. Click Merge Selected to complete the operation.